A reliable cleaner doesn't mean just cleaning clothes. Hi Tech Organic Cleaners has the quality, the service and the reliability that enables us to be a reliable cleaner. Whether it's your daily casual apparel or delicate designer's garments, our knowledgeable professional staff members assure you of high quality garment care. Pick up and Delivery service is available throughout Murfreesboro area. We are masters at hand-finishing, alteration, tailoring, shoe repair and emergency services. 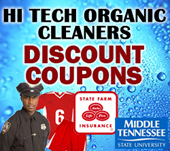 Hi Tech Organic Cleaners has been servicing Murfreesboro for over 10 years. Our commitment to recruiting and retaining top personnel in the wet cleaning field along with consistent training programs ensures our staff is the best in our field. In addition, we believe in securing the best equipment and software available to meet our customer needs.